Sinks are indispensable in every bathroom. Besides being functional, a sink also has a decorative purpose. A new sink can immediately spruce up an outdated bathroom. Choosing a sink might not seem like a challenging task, but did you know there are 10 different bathroom sink types? 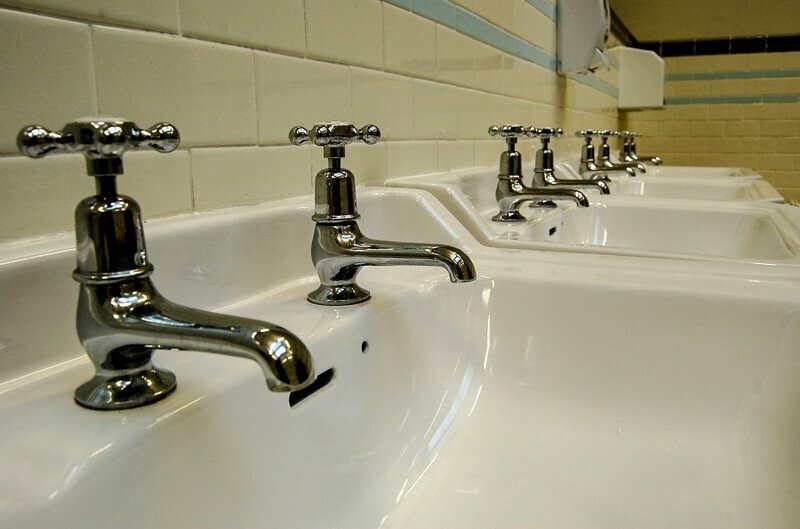 To help you with this task we will walk you through different types of sinks, so you can make the best decision whilst shopping for your new bathroom sink. Simply put, the vessel sink is as the name suggests, a bowl type of sink. It is a free-standing bowl sitting entirely on top of the vanity countertop. What we love about the vessel sink is the decorative quality. It is available in a multitude of shapes, sizes, and materials, and it easily goes with any style of bathroom. If you want to add a statement piece to your bathroom the vessel sink is a great choice! It is also a functional choice if you need a sink that can hold lots of water. On the other hand, cleaning around the base and the back of the bowl isn’t that easy. Keep in mind you may need to evaluate the height of the countertop since you don’t want to end up with it being placed too high making it uncomfortable to use the sink. Also known as a drop-in sink, a top mounted sink can be placed in the cutout on the top of the vanity with the rim of the basin sitting on top of the countertop holding it in place. 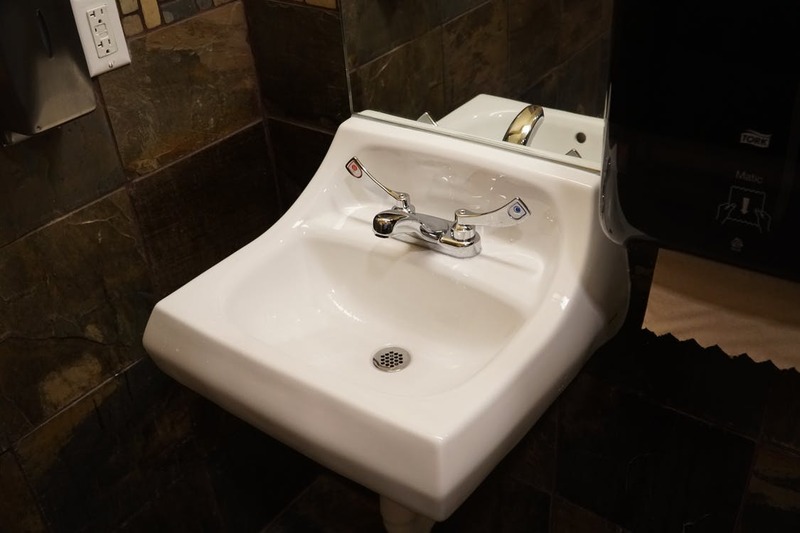 These sinks are suitable for any type of countertop material and are very easy to install or replace, making them a common feature in most households. Though top mounted sinks may be very practical and cost-efficient, they usually aren’t that pretty. Furthermore, the rim makes it difficult to wipe water from the counter into the sink posing a small cleaning challenge. One of the most popular bathroom sink types is the undermount sink. The undermount sink is mounted entirely underneath the vanity countertop. Compared to the top mounted sink you won’t have a cleaning problem with the undermount sink due to its smooth countertop-to-basin transition. Giving a more sleek and modern feel to your bathroom. If you are a busy family needing lots of countertop space this is the sink for you. By being placed underneath the countertop, an undermount sink does take away some storage space from the vanity. It is also more expensive than most top mounted sinks and isn’t suitable for every countertop material. This sink is secured directly to the wall without needing support from a countertop or vanity. Wall-mounted sinks are ideal for powder rooms and small bathrooms. Having no countertop or vanity underneath visually expands the space making the bathroom feel bigger and more spacious. 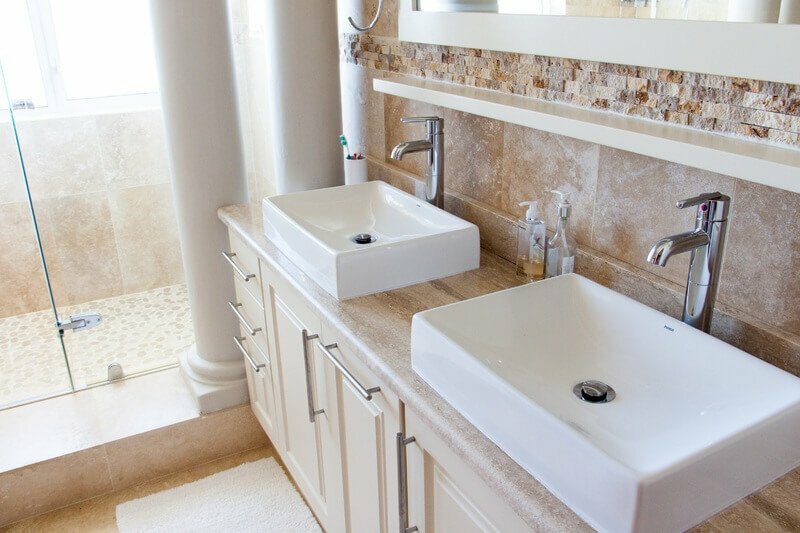 Additionally, since there is no countertop, there is less clutter and is a good fit for minimalist style bathrooms. Since wall-mounted sinks have no storage space underneath, considering your need for storage before purchasing a wall-mounted sink is important. A more traditional choice compared to the wall-mounted sink is a pedestal sink. Slightly related to the wall-mounted sink, the basin is wall-mounted but is resting on a matching pedestal. Vintage charm pedestal sinks, like modern wall-mounted sinks take up little floor space. Being so similar, the pedestal sink has similar advantages and drawbacks. If you have a small bathroom or powder room the pedestal sink is the way to go as it occupies minimal space. Besides lacking storage space, pedestal sinks mostly have a gap between the wall and the back of the pedestal which can be harder to clean. However, pedestal sinks can nicely hide the pipes if you don’t want any pipes showing. The console sink is also similar to the wall-mounted sink as well as the pedestal sink. The basin is attached to the wall with two or four legs offering support. This is a sink that is highly recommended for small bathrooms. Different from most of the other sinks, this console sink sometimes offers open shelving underneath the sink. Though it can have some storage space, plumbing is usually exposed which might not be your cup of tea. This type of sink sits in front of the countertop and vanity. If you have limited space in your bathroom, but still need storage space, this semi-recessed sink gives you the best of both worlds. A semi-recessed sink doesn’t use much floor space. The storage space underneath the sink is shallower compared to a traditional vanity. With no countertop surrounding the entire basin, there is a chance of more water spills on the floor. Made from the same material as the countertop, it is called an ‘integral sink’ when the sink and vanity are one piece. Being a seamless one piece with the surrounding counter makes the integral sink one of the easiest to clean. A good option for very busy family bathrooms. The sleek design is a great match with modern or contemporary style bathrooms. 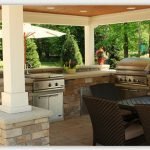 Besides having a higher price point, replacing it when damaged is harder and sometimes requires replacing the entire unit. Trending amongst the bathroom sink types is the slim and simple yet stylish washplane sink. 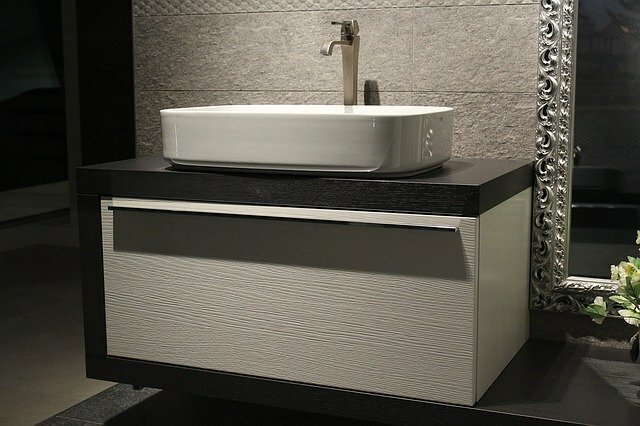 Often found in high-end hotels and restaurant bathrooms, the washplane sink is being spotted more and more in households nowadays. A washplane sink consists of a single piece a material and has a small trough catching the water. Similar to a wall-mounted sink the washplane sink takes up no floor space. Having no plug and being extremely shallow they cannot hold much water. These are eye-catching and stylish and are perfect for powder rooms. Trending nowadays is a two-in-one sink, basically having two faucets installed to one wide basin. But do you need two faucets or would you rather install a double sink? Take into account the time schedule of your family members. If you all get ready around the same time in the mornings, then a double sink or two-in-one sink might be the better option. Besides daily routines, the most important factor is space. Do you even have enough space in your bathroom for a double sink? And how much storage space do you need? By knowing your needs you can now easily weigh your options when you go sink shopping. Simoné is an Online Marketing Analyst specializing in social media at Kukun. She is a home improvement enthusiast who loves to write on home remodeling/ interior design topics. She loves to travel and work on video editing and filming in her spare time.